You are in Home / News / The day has finally arrived! Well, the day has finally arrived and we couldn’t be more ready, the question is… are you!? We were back at Gorse Hill Studios on Thursday, feeling very much back at home. After spending some incredibly exciting rehearsals at different locations we were all eager to reflect and feedback about all of our hard work. We discussed all of the positive things that we discovered during our dress rehearsals and were able to recognise how our confidence and imaginations had grown. Noting down these discoveries allowed us to later revisit them and discuss, in our groups, how they could work for us, establishing some of the fun ‘games’ we’d like to play during Shadow Girl – the city streets. Thursday’s rehearsal mainly gave us the opportunity to ‘check back in’ with all of the different performance skills we’ll be boasting. We revisited our relaxation practice, had fun clowning around with everybody’s favourite Boss Clown, Tom, making an appearance and we created beautiful moving tableaux. Revisiting much of our previous rehearsal room training highlighted how our actor’s instincts, imaginations and toolboxes had grown during just three weeks of rehearsals. With all of our performance skills finely honed, all that was left to do was our official site recce on Friday. We explored our dressing room space at Cross Street Chapel, with Chrissy and Susan finding much to be inspired by there, Beatrix Potter and Mrs Gaskall to name a couple! We journeyed to our starting position on St Ann’s Sq, even attracting some by-standers to watch us curiously, we hopefully didn’t give too much away! 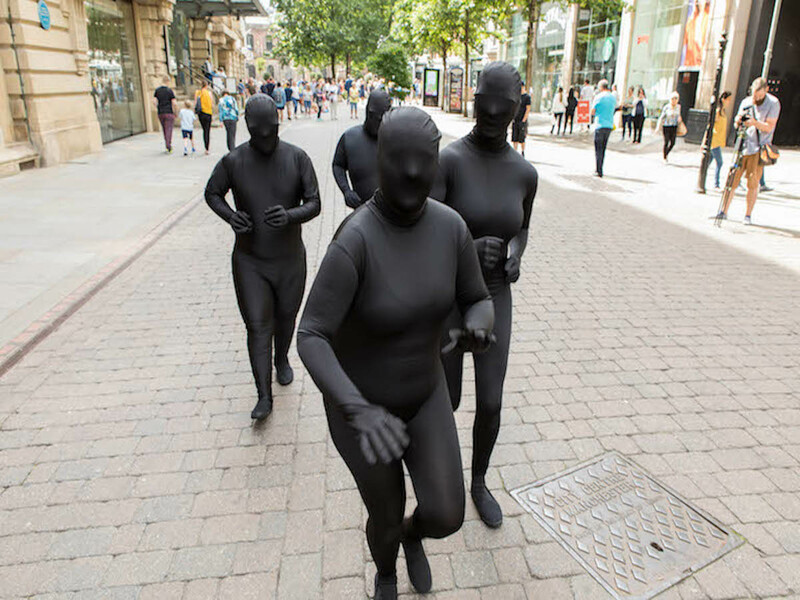 And finally, we were let loose in our groups to find inspiration for the following day, although much of our inspiration will come from the things we notice and encounter during the performance itself. 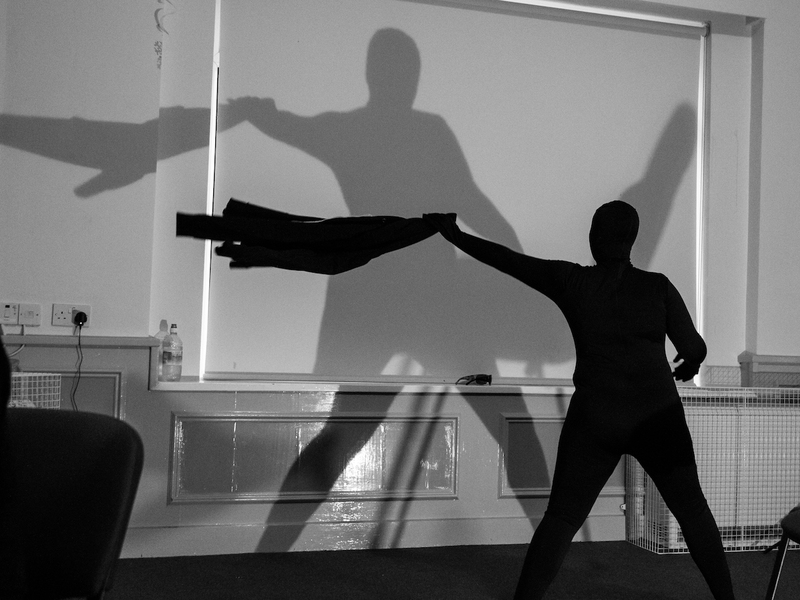 If you do manage to catch our silent shadows, sneaking, creeping, dancing, playing, exploring and slinking through the city today, then be sure to tweet about us and join the conversation about disability, visibility and vulnerability by using #ShadowGirl. Word of Warning and Proud and Loud Arts will be tweeting updates throughout the day, follow @WarnMcr and @proudandloudart to ensure you don’t miss out.